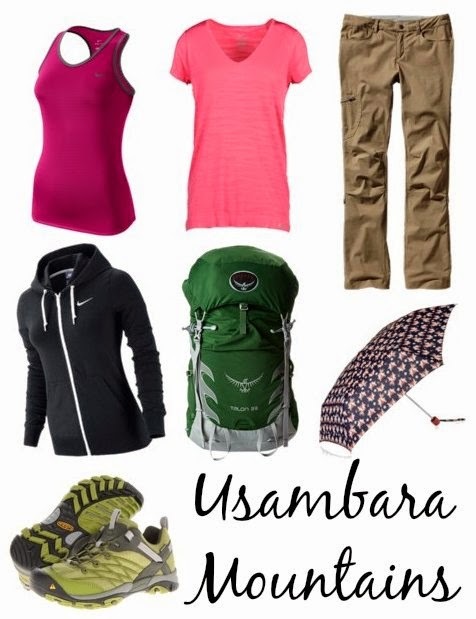 Trekking Pants: If you plan to trek in the Usambara Mountains I would suggest wearing lightweight trekking pants. I have never felt so uncomfortable wearing shorts. I think I heard a kid from one of the villages ask "why are you naked?" I have traveled to many countries before and I have never felt inappropriately dressed in my western clothes, however, it seems to be very different in Africa. Short-sleeves and Long-sleeves: For the most part it was sunny and warm so short-sleeve dry fit shirts were perfect for days in the sun, however, in the evening it would cool off quite a bit. Umbrella: On our last day it poured rain and our raincoats were too hot to wear. If we had an umbrella we would have been better off. I ended up walking in my dry fit t-shirt and embracing the rain. Footwear: My tennis shoes did the trick in terms of footwear since the trail was not rugged but I don't think my tennis shoes will ever be as clean as they were. Change of Clothes: Even though we packed light a second pair of clothes to change into after trekking was worth the weight. It was very dusty on the dirt trails and by the end of the day we wanted a break from our hiking clothes.